It's been a while since I've participated in Skywatch. It's good to be back. Flock of birds heading south as the sun set over the Tel Aviv beach. Not participating, but that does look delightful. Wonderful capture! I like the simplicity; lots of action here with just a few "brushstrokes." That's really amazing - great catch! Simply...beautiful! The sky can be so magical, can't it! Very beautiful photo for SWF;Robin and it´s great you are back!I hope you had a good start into the new year and have a nice weekend! I'm glad you went back to sky watching! Gorgeous photo! Happy New Year. Great capture of the birds! I like the background of soft and pink. Fantastic shot. Nice formations by the birds. Fabulous picture, Robin! 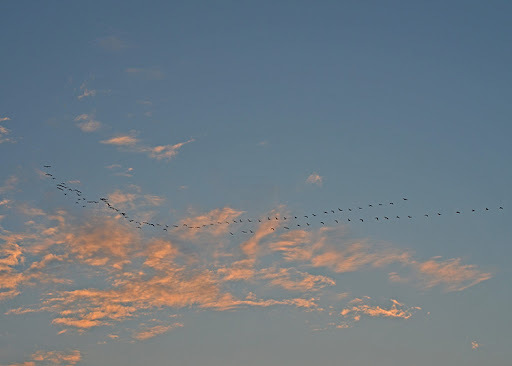 The sunset is beautiful, and the movement path of the birds too. I love to watch the sky,find it very relaxing and a reminder of how tiny a part of nature we are. Love the contrast of the birds and clouds ..
Israel, the land of migration and immigration. The daring young man on the... tightrope?